How many reviews are going to begin that way? How could they not? 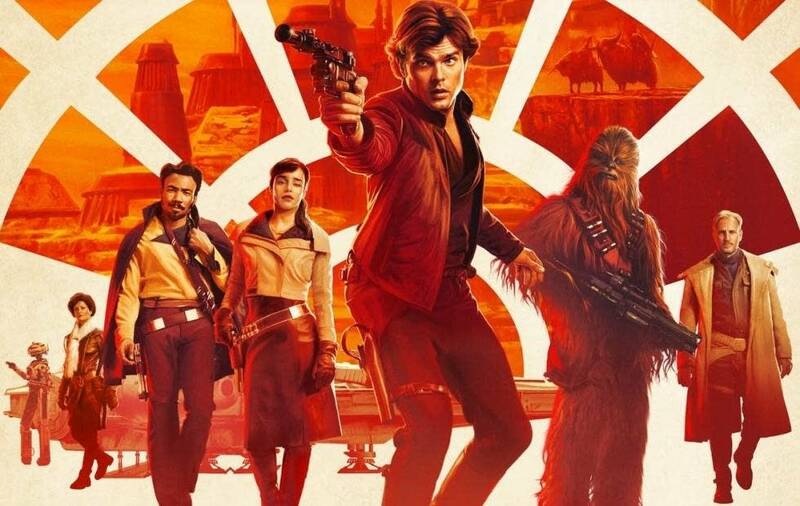 Solo: A Star Wars Story looked certain to end the hot streak that Disney-era Lucasfilm has enjoyed since the stunning success of The Force Awakens (2015). Original directors Phil Lord and Chris Miller were fired several months into the shoot, replaced by Ron Howard. The premise was already risky: Lucasfilm was rebooting one of the most iconic characters in film history, to be replaced with a younger model (Alden Ehrenreich). There was enormous excitement around the casting of Donald Glover as the young Lando Calrissian, but as the film's release has approached, Glover's stature has skyrocketed: right now, he has the number one song in the country, buoyed by the most urgent and talked-about video since "Formation." Does the world now really want to see Glover play second fiddle to a scruffy-looking nerfherder? In truth, there is some awkwardness to that, and the most common complaint about Solo is sure to be that it needed more Lando. (He's already the de facto star of the posters.) That said, Lucasfilm can't really be accused of false advertising, given the film's title. This is the story of how Han the Corellian alley rat became Han Solo, galactic antihero. The film grinds into gear with less fanfare — literally — than any previous film in the series. We're on Corellia, the grimy home world of the man who will become Solo (exactly how that happens is one of the film's revelations). A sort of interstellar Glasgow, Corellia produces the ships that fight the star wars, and young Han is angling to fly one of them out of there as quickly as possible. The rest of the story involves a romance with his fellow Corellian Qi'ra (Emilia Clarke), a daring escapade involving veteran criminal Tobias Beckett (Woody Harrelson), entanglement with a rival gang that wants in on the action, and dealings with vice lords like Dryden Vos (Paul Bettany). We know going in that we're going to learn how Han met Chewbacca (Joonas Suotamo) and Lando, and how the latter's pristine starship became Han's hunk of junk. Although the film deals in the same kind of backstory fill-in that the gorgeous Rogue One (2016) purveyed, the tone here is far less high-flown. The challenge the franchise faced was to delve into the galactic underworld, a realm that intrigued George Lucas himself: in the 1980s and '90s, he spent years developing a prospective TV series set in that world, but it never came to fruition. That means fewer Stormtroopers, fewer lightsabers, fewer Skywalkers. Though not aligned with the 1977 original as precisely as Rogue One, Solo plants its hero in the world where Ben Kenobi will ultimately discover him: a wretched hive of scum and villainy, writ large. Onscreen, that proves liberating. Solo can focus on telling its own story, with constant nods to the established canon but without being yoked to an epic saga (yet). It's actually refreshing to discover that we didn't meet every gangster in the galaxy in the original trilogy, and with the Jedi nowhere to be found, we understand why Solo was suspicious of their supposed wizardry. As an exercise in world-building, Solo is richly rewarding. There's a three-dimensional train heist, a towering space yacht, and a confrontation on one of the franchise's beloved desert planets — this time with an aesthetic that narrows the gap between Luke Skywalker's Tatooine and Mad Max's post-apocalyptic Australia. The new Lucasfilm has also been busily filling its universe in with books, comics, and cartoons: Solo is neatly calibrated to reward fans who've been following along, with characters like Lando's indignant droid copilot L3-37 (Phoebe Waller-Bridge) having been introduced there first. Solo is plenty exciting, but doesn't really try to be particularly stirring. It's sufficient that by the end of the film, Han might be starting to come around to the idea that he does have a moral compass, much as he might try to deny it. At its best, Solo recaptures the sense of fun and freedom that Lucas loved in the low-budget space serials that inspired Star Wars. In that sense, it's a long-overdue return to the franchise's scrappy roots — apt, given that it's the first Star Wars movie to get a summer release since 2005's Revenge of the Sith. Composer John Powell also finds, as did Michael Giacchino in Rogue One, that John Williams is a hard act to follow. There's a scene in which a volatile superfuel has to be injected into the Millennium Falcon’s engine, and that seems an apt analogy for the impact Williams's original music has when quoted by Powell. Williams has, however, contributed a new theme for Solo: the only major character from the original trilogy who didn't get his own theme back in 1977. You can almost imagine Ford grumbling, "I never asked for a theme." Don't expect Baby Driver in space: Howard doesn't have the fluency with action sequences that his peer Star Wars directors evince, but he more than makes up for it with a strong sense of character development and comic timing, which are really what this movie is all about. Rope swings and showy saber battles are for Jedi, not for smugglers. Like I said, Solo can't be accused of false advertising. How Meco made 'Star Wars' music a disco sensation To understand just what a unique cultural phenomenon 'Star Wars' was, consider this: a disco adaptation of John Williams's symphonic score was not only recorded and released, it became a number-one hit record. Review: Star Wars gets existential in 'The Last Jedi' The latest installment in the Star Wars saga finds Luke Skywalker and Princess Leia, along with their new friends, grappling with mortality. Pretty heavy for a space opera, but would you want it any other way? Star Wars at 40: Ten ways George Lucas changed the world 40 years ago today, the original 'Star Wars' was released in movie theaters. The world would never be the same again.